Grilling is the absolute best way to enjoy summer cooking! Vegetables are slightly charred, very much tender and flavorful as can be. And while your veggie skewers are sitting on one side, you can grill some BBQ chicken and bacon skewers on the other. You may even be inspired to glaze the zucchini with some barbecue sauce while you are at it. Skewer preparation is so uncomplicated that all hands in the kitchen can get in on the action – it is an activity for all ages. Not only is it fun to thread the veggies (or protein bites), but it has an incredible, edible outcome too. Take this recipe, easy as it is, or step up your kitchen skills and thinly slice the zucchini lengthwise, threading it like a ribbon between the lemon slices, adding some tomatoes and button mushrooms, perhaps? Whichever way you choose, you cannot go wrong with putting any amount of vegetables, in any order, on your skewers. It pays to be prepared: if you are using wooden skewers, make sure to soak them for at least 30 minutes before getting started, so do this before heating up your grill and chopping your vegetables. Keep that in mind and all will be fine! Of course, you should always choose quality ingredients for the best possible meal. We definitely recommend to pick organic lemons here, after all, you can eat the peels for their health benefits as well. In a bowl combine olive oil, garlic and oregano; season to taste. 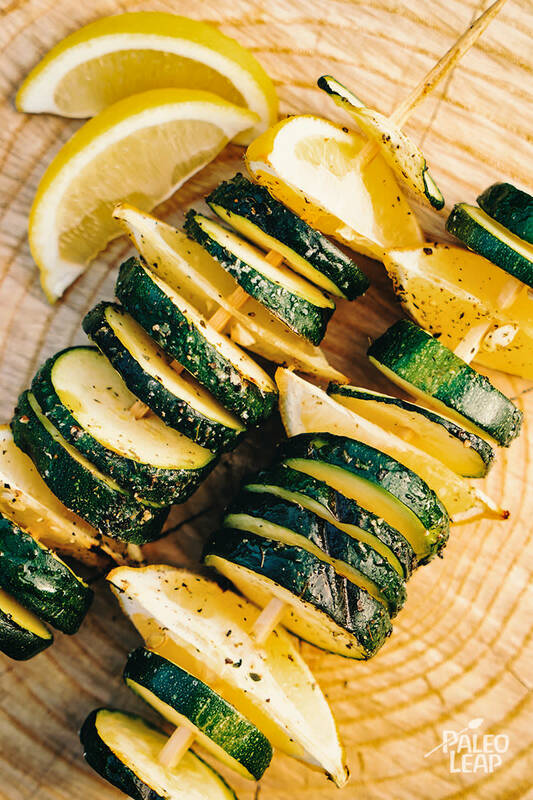 Thread the zucchini slices and the lemon wedges onto the skewers. Brush the skewers with the olive oil dressing. Grill until zucchini are tender, 2 to 3 minutes per side.